I am fundraising to buy resources for my classroom. 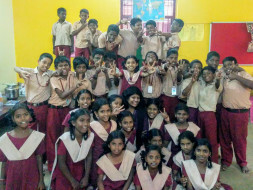 I teach a class of 50 brilliant and inquisitive sixth graders at Kottur High School run by the Corporation of Chennai. On the verge of their teens, they are beginning to explore, challenge and find their place in the world. The only thing that defeats them - resources. Most of them come from economically disadvantaged communities and are often unable to access resources needed to enrich their learning. As the children have little access to books and technology outside of school, there is a telling need for the classroom to be well-equipped. The funds would go towards providing resources and opportunities that would enrich the classroom and put the children on a different life path. 1. Activity-based and hands-on learning for deeper understanding. 2. Opportunity to discover their passions and develop skills that would help them realize their dreams. 3. Explore knowledge beyond their curriculum. Thank you for contributing to this cause. I have finished my fellowship with Teach for India. These funds have been a great blessing in the past two years. The biggest spend was upgrading our class library. Older students need more challenging books to keep them interested. For the first time in their lives, many of them have tackled full-length novels independently. Some books that they loved were Matilda, BFG, Harry Potter, Alice in Wonderland, Wizard of Oz and books from the Famous Five and Secret Seven series. The money also helped to buy art supplies, puzzles and activity kits that helped the children learn different things and in different ways. Along with my class of Warriors, I would like to thank you for making our lives better and enriching our learning. Please keep donating to wonderful causes. All the best Viveka and good Initiative ! !